My favorite recipes are ones that can be reinvented for any season, any craving, any occasion or whim. This Peanut Butter Pie is one of those recipes. Stripped down, this is a pretty basic peanut butter pie. It starts with a thick, buttery graham cracker crust topped with a no-bake cream cheese and peanut butter filling. The filling on it’s own is divine licked straight off the spatula or (if you’re more refined than the likes of me) as a dip for apples. But this pie is far more than basic. It can be served as is after chilling in the fridge, or it can be served frozen in the summer months. It can be loaded with peanuts and chocolate or caramel or peanut butter cups or whipped cream. This time of year, with the holidays quickly approaching, I’m looking to up my game in the dessert department. I want something elegant and lovely, something worthy of any Thanksgiving table. That’s where the meringue comes in. Meringue is one of those deceptively easy recipes that instantly increases the wow factor. I’m always so mesmerized by the process of making meringue. If you’ve never done it before, you should try it, just for the experience. With the help of an electric mixer and a few minutes, four tiny egg whites billow up into mounds of fluffy, slightly sweet meringue. I’m astounded every time that such a small, silly thing like egg whites can become such a glorious treat. It’s like covering your pie with a soft, puffy, pillow of marshmallows. Just perfect. 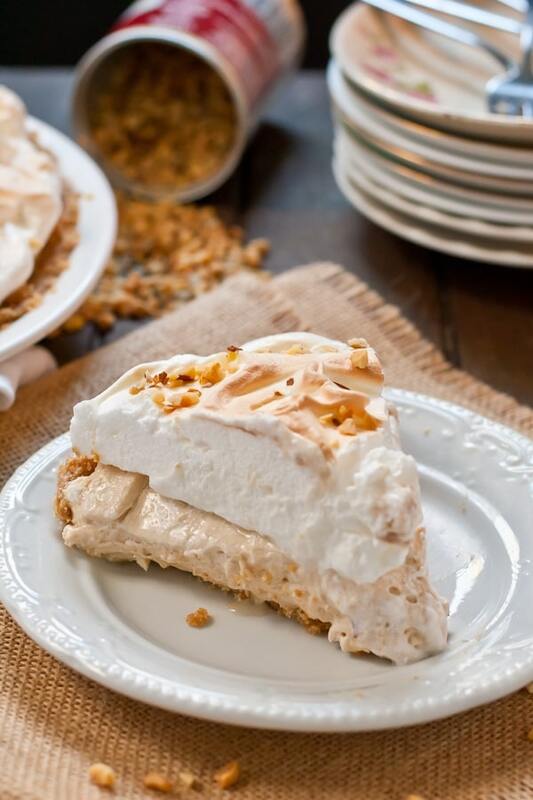 The Mr. raved about this pie, telling me it reminded him of our favorite Amish Peanut Butter Dip. 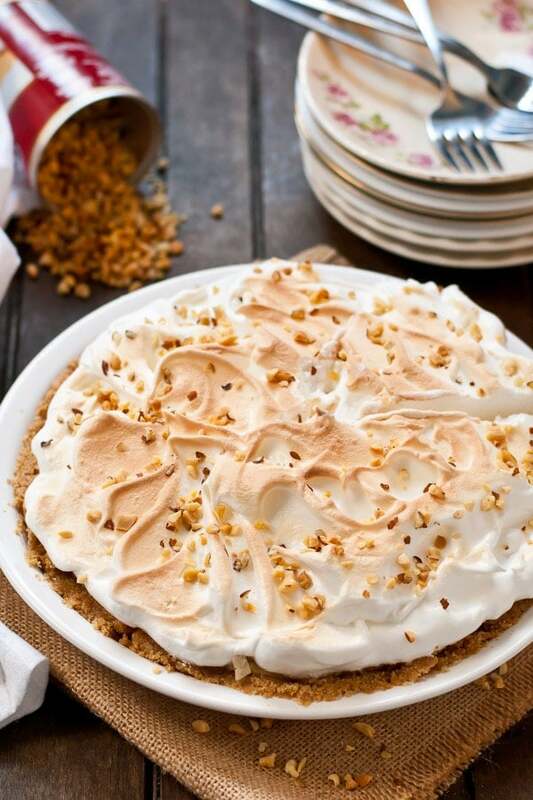 Because of the graham cracker crust and marshmallowy meringue, this pie also has a definite s’mores feel to it. Add a drizzle of chocolate at the end and you’d be absolutely in business. A few notes about the process. 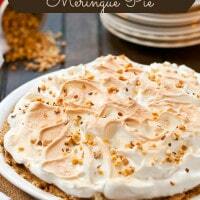 You’ll need to make and chill the crust and filling for this pie before doing the meringue. The filled pie can be frozen for a few weeks in advance if you’d like to get a jumpstart on your holiday baking. Then, when you’re ready, let the pie thaw in the fridge overnight, top with the meringue, and run under a broiler for a few minutes or toast with a butane torch if you have one. 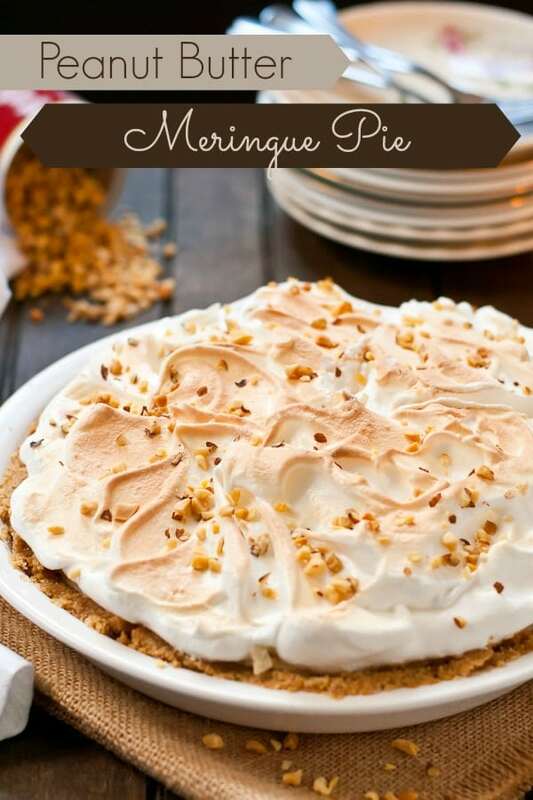 Like most meringue pies, this is really best served fresh, but you can refrigerate it with the meringue for a day if needed. Either way, this would be stunning on your holiday tables and a definite hit with kids AND adults! Combine the graham cracker crumbs, melted butter, and sugar in a large bowl. Stir until mixture starts to adhere to itself. Firmly press the mixture onto the bottom and sides of a 9 inch pie plate. Refrigerate for at least an hour or cover and refrigerate overnight. Beat together the cream cheese and peanut butter until smooth. Add the powdered sugar and beat on low speed until most of the powdered sugar is incorporated, then increase the speed to high and beat until smooth. Fold in the whipped topping. Pour the filling ingredients into the prepared pie crust. At this point, the pie can be covered and refrigerated overnight or frozen until ready to serve. Add the egg whites and cream of tartar to the bowl of an electric mixer fitted with the whisk attachment. Beat on medium speed until mixture is foamy. Add the sugar, a little bit at a time, and continue beating on high speed until stiff, glossy peaks form. This could take only a few minutes or seven or eight minutes. It's always different for me. Dollop the meringue over the chilled filling, making sure to go all the way to the edges. Use a spoon to swirl it until you have the look you want. Place the pie under a low broiler for 3-4 minutes or until peaks are golden brown. Serve immediately or cover loosely (I use toothpicks in the meringue to keep the saran wrap from sticking) and refrigerate for up to 24 hours. Don't throw away your leftover egg yolks. Save them for use in one of these 50 egg yolks recipes!